Don't be a noob. Study up and know what to look for at Squad's new dining hall. South Quad’s brand new, state-of-the-art dining hall is all the rage this year. However, it’s easy to get lost in the overwhelming amount of new options. But don’t worry, here’s your guide to finding the best (and worst) choices on the menu. This one will definitely have you goin’ back for more (and not just because the portions are tiny). 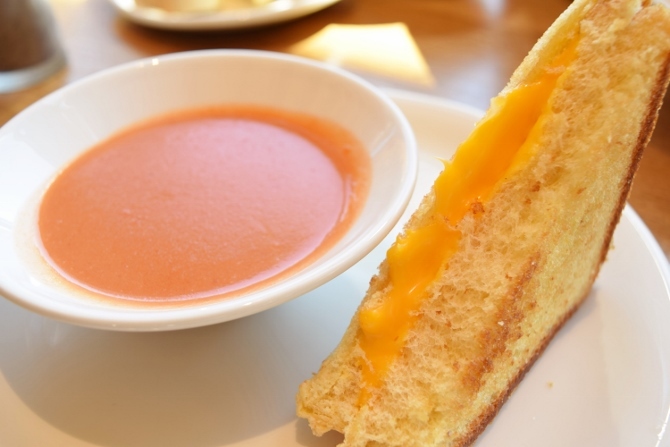 The creamy tomato soup has the right consistency and is an excellent match for the soft-yet-crunchy grilled cheese that is toasted to perfection. But make sure you get it while it’s hot. It’s worth the wait if it means you’re getting a fresh batch. No need to spend seven bucks on a 600 calorie burrito from Chipotle when you can satisfy your Mexican craving at South Quad. This killer combo of fresh chicken, feta cheese, yellow rice, corn and bean salsa and a dollop of sour cream hits the spot. The spices blend perfectly and are accompanied by a hard-shell tortilla bowl. I was pleasantly surprised to find a high quality Mexican dish at a college dining hall. Just keep your eye out for those soggy tortillas. Ah, my personal favorite. I have found myself eating two of these a day for a week straight. With your choice from six different cheeses, six different toppings and four different wraps, these sandwiches are as good as it gets. Turkey, ham or chicken bundled together with toppings galore in a tomato, spinach or whole wheat wrap and your choice of dressing (including pesto and chipotle mayo) never fails to hit the spot. Pro tip: ask to have it toasted. Nothing beats melted cheese inside a warm tortilla. 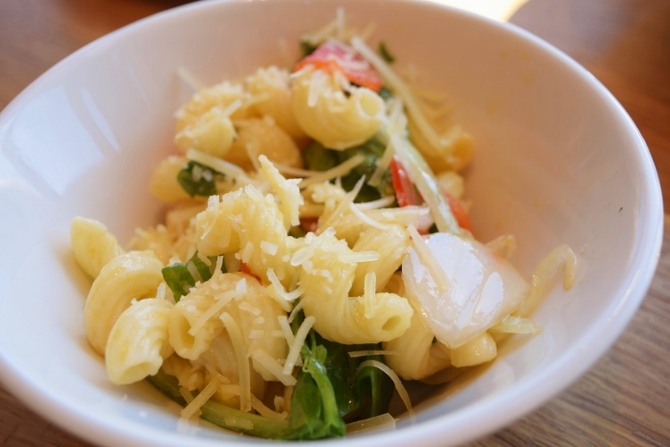 Thanks to the talented student-chefs working their magic behind the counter, we can enjoy a personalized bowl of pasta for dinner. Chicken or pork, marinara or alfredo, topped with your choice of mushrooms, red onion, green peppers, spinach, tomato and shredded parmesan are all mixed perfectly into a bowl of deliciousness. Don’t be too influenced by your craving for a home-cooked meal. This is not exactly like mother used to make. The green beans are pretty bland and the mashed sweet potatoes are a bit too spicy. The steak had potential, but did not quite make it. We’re hoping South Quad can step it up next time with more flavorful and tender meat. Unfortunately, it doesn’t look like South Quad can fully satisfy your need for Chinese. The white rice lacks flavor, however the sweet and sour sauce helps a bit. But steer clear from the fried pork, my friend. Not only are the little nuggets tough, but the flavor of it is nothing compared to No Thai. Stick to ordering in. You’re probably wondering: how can you mess up a cheeseburger? Sadly for South Quad, it’s not too hard. We give them credit for supplying tomato, lettuce and cheese, but the burnt patty could really use some work. Luckily the side of fries are tasty, especially with ketchup. But it looks like you might be going to BurgerFi for your next cheeseburger craving. If you’re looking for a good dose of veggies, this might be right for you. The red sauce is surprisingly tasty mixed up with corn, peas, carrots and eggplant. 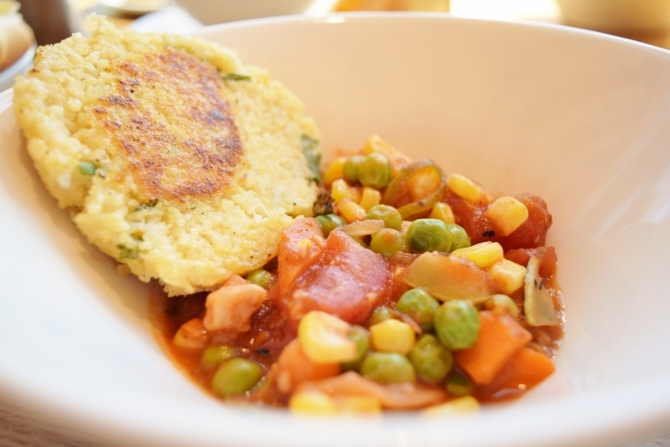 The couscous patty is a pretty good companion for the veggies, but if you’re not a couscous fan I would skip it. But this is definitely a solid option for you vegetarians. The hummus options are definitely worth a try, but not the best choice on the South Quad menu. The plain hummus is a safe bet, a little garlic-y, but makes a good snack withs some carrots or celery. Beware of the basil hummus—it’s a great flavor but super strong. A little goes a long way. Or you can just try to make your own hummus using this recipe. What’s better than breakfast for dinner? Since brunch is my all time favorite meal, I’ve got a lot to say about South Quad’s options. Unfortunately you can’t quite get the runny yolk on a warm piece of avocado toast, but South Quad is a step up from a bowl of Cheerios in your dorm room. Make sure you check out the made-to-order omelets where you can enjoy some freshly prepared egg whites with veggies of your choice. If for some reason the omelet-makers have the day off, try the pre-made scrambled eggs or egg whites. The egg whites are a little suspicious, but throw some cheese on there from the salad bar with a little salt and pepper and you’re good to go. If you’re feelin’ potatoes, the tater tots are definitely worth a try. They may be a bit oily, but dip them in ketchup and you’ll never know the difference.